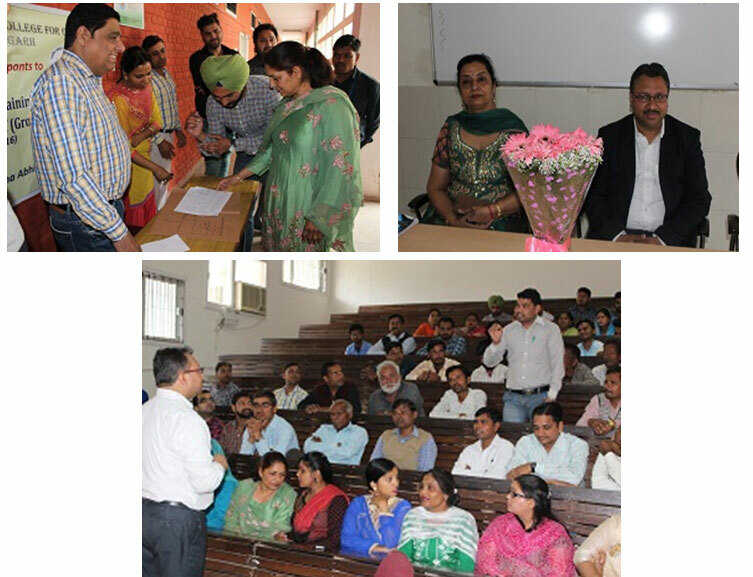 One Day Capacity Building Training Workshop for Group D Staff members was organised in the College. Around 63 Group D employees participated in the Workshop. In the morning session 1&2 Mr Manish Kumar Aggarwal delivered a talk on “Multitasking: a myth or Reality” which was followed by an interaction with the participants. He suggested those ways and means to do multitasking which can make them more versatile in the performance in their jobs. Lot of doubts were raised by the participants, which were suitably answered by the speaker. Participants thoroughly enjoyed the talk. In the 3rd Session ,Dr Anil Garg,SMO,Health Department, Chandigarh Administration, delivered a lecture on “Hygiene: A contraption to prevent the spread of infectious Diseases” Dr. Garg apprised them of the ways and means to keep themselves clean and hygienic as it was very essential to staying healthy in life. He also suggested them ways to save themselves from the dreadful diseases.